The Queenstown Lakes district region property pulse factsheet for July 2012 is published using data from Realestate.co.nz and REINZ (Real Estate Institute of NZ). 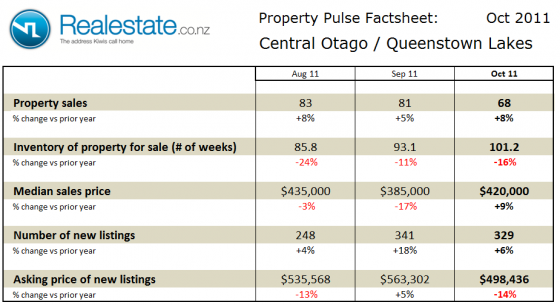 Property sales across the Queenstown Lake and Central Otago region at 76 fell significantly on a seasonally adjusted basis in July and was up only 3% as compared to a year ago. The inventory of unsold houses on the market rose to 74 weeks of equivalent sales, this level remains well below the long-term average of 100 weeks of equivalent sales. Median sales price of properties sold in the Queenstown Lakes and Central Otago region fell from June at $420,000 was up just 2% as compared to a year ago. The asking price expectation of new listings fell 7% as compared to a year ago at $505,294. The level of new listings coming onto the market in July at 249 was up as compared to prior month and represented a 19% rise as compared to a year ago. 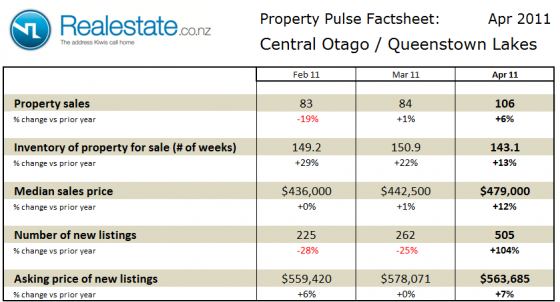 This data indicates that the Queenstown Lakes / central Otago region continues to favours sellers in the market although the recent fall off in sales matched to the rise in new listings is moving the market back into a more balanced position. 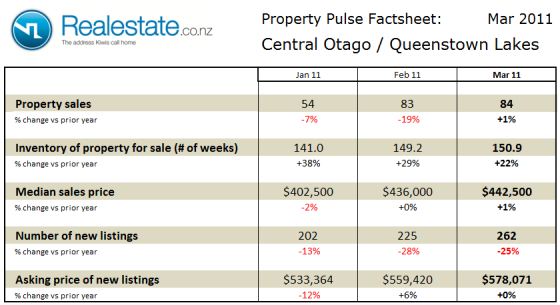 The Queenstown Lakes district region property pulse factsheet for June 2012 is published using data from Realestate.co.nz and REINZ (Real Estate Institute of NZ). Property sales across the Queenstown Lake and Central Otago region at 95 fell significantly on a seasonally adjusted basis in June but was up 13% as compared to a year ago. The inventory of unsold houses on the market at 66 weeks fell from the May figure of 85 weeks, this level remains well below the long-term average of 101 weeks of equivalent sales. Median sales price of properties sold in the Queenstown Lakes and Central Otago region rose significantly from May at $465,000 was up 7% as compared to a year ago. The asking price expectation of new listings fell 1% as compared to a year ago at $516,056. The level of new listings coming onto the market in June at 244 was down as compared to prior month and represented a 6% as compared to a year ago. 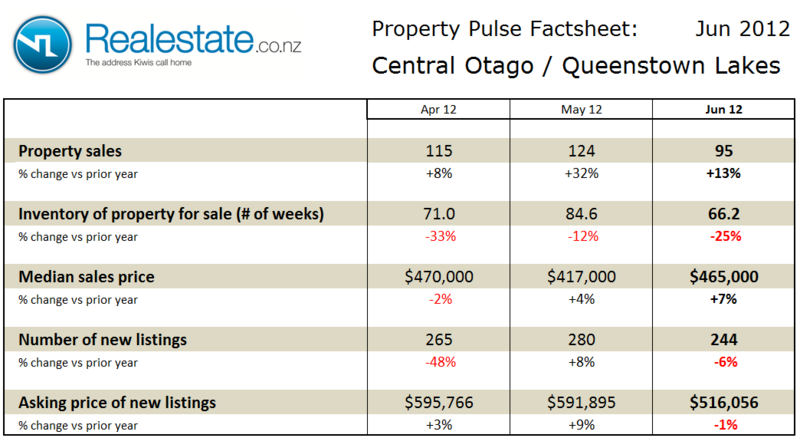 The Queenstown Lakes district region property pulse factsheet for May 2012 is published using data from Realestate.co.nz and REINZ (Real Estate Institute of NZ). Property sales across the Queenstown Lake and Central Otago region at 124 rose sharply on a seasonally adjusted basis in May and were up 32% as compared to a year ago. The inventory of unsold houses on the market at 85 weeks rose slightly but still remains well below the long-term average of 101 weeks of equivalent sales. Median sales price of properties sold in the Queenstown Lakes and Central Otago region at $417,000 was up 4% as compared to a year ago. The asking price expectation of new listings rose 9% as compared to a year ago at $591,895. The level of new listings coming onto the market in May at 280 was up as compared to prior month and up 8% as compared to a year ago. 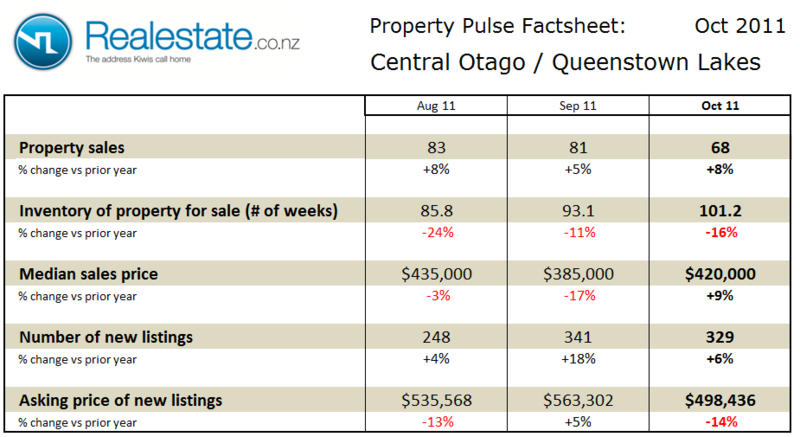 The Queenstown Lakes district region property pulse factsheet for November 2011 is published using data from Realestate.co.nz and REINZ (Real Estate Institute of NZ). Property sales across the Queenstown Lake and Central Otago region at 85 rose on a seasonally adjusted basis in November and were up 13% as compared to a year ago. The inventory of unsold houses on the market at 105 weeks rose slightly but still remains in line with the long-term average of 105 weeks of equivalent sales. 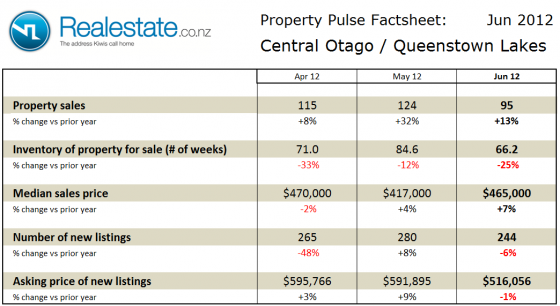 Median sales price of properties sold in the Queenstown Lakes and Central Otago region at $405,000 was down 4% as compared to a year ago, this continues a steady fall in prices through the year. The asking price expectation of new listings fell by 13% as compared to a year ago at $507,028. The level of new listings coming onto the market in November at 293 fell as compared to prior month and was up just 8% as compared to a year ago. 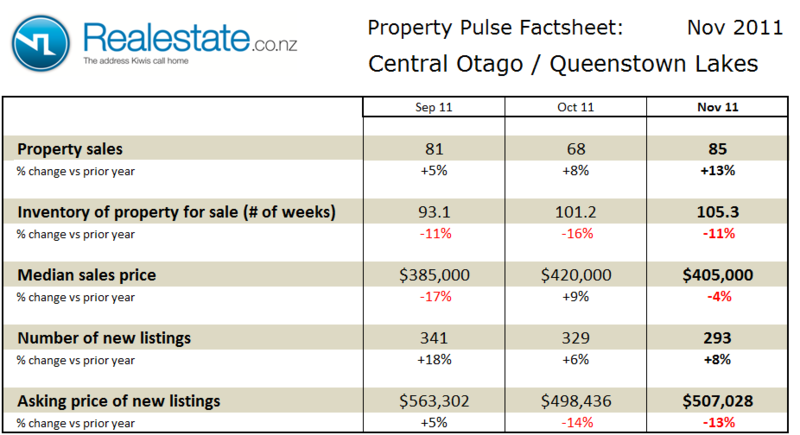 The Queenstown Lakes district region property pulse factsheet for October 2011 is published using data from Realestate.co.nz and REINZ (Real Estate Institute of NZ). 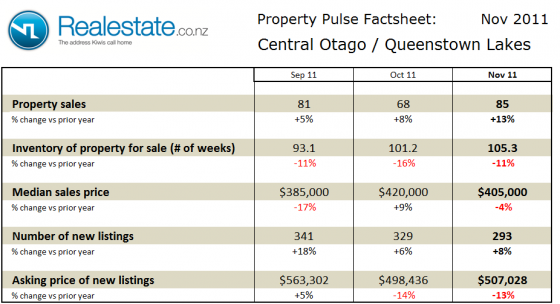 Property sales across the Queenstown Lake and Central Otago region at 68 in the month fell significantly on a seasonally adjusted basis in October and were up just 8% as compared to a year ago. The inventory of unsold houses on the market at 101 weeks rose slightly but still remains in line with the long-term average of 100 weeks of equivalent sales. Median sales price of properties sold in the Queenstown Lakes and Central Otago region at $420,000 was up 9% as compared to a year ago, and up significantly on the prior month. The asking price expectation of new listings fell by 14% as compared to a year ago at $498,436. The level of new listings coming onto the market in October at 329 fell as compared to prior month and was up just 6% as compared to a year ago. 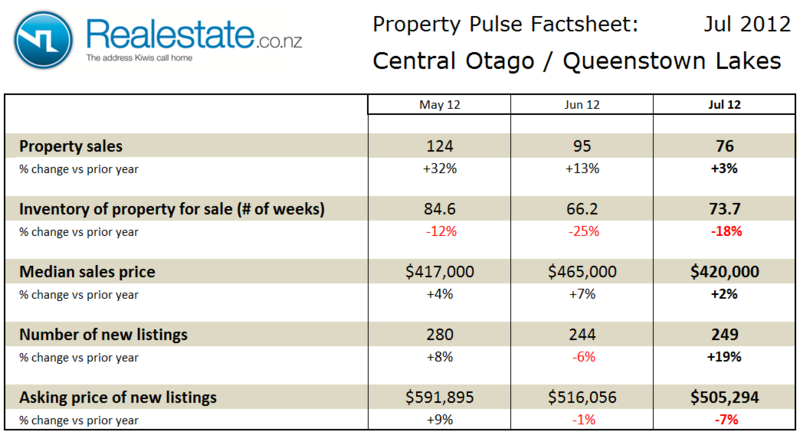 The Queenstown Lakes district region property pulse factsheet for May 2011 is published using data from Realestate.co.nz and REINZ (Real Estate Institute of NZ). 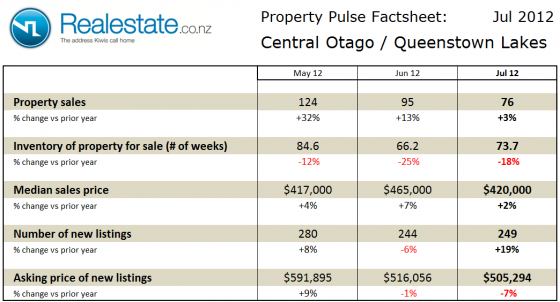 Property sales across the Queenstown Lake and Central Otago region at 94 in the month fell on a seasonally adjusted basis in May but were up a significant 40% as compared to a year ago. The inventory of unsold houses on the market at 107 weeks fell to edge closer to the long-term average of 100 weeks of equivalent sales. 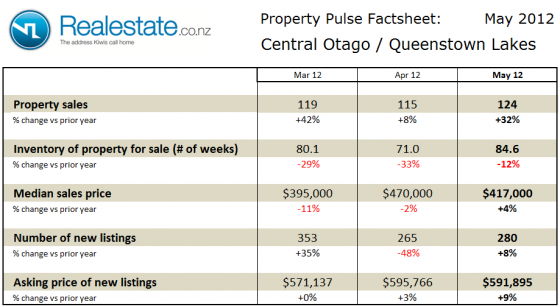 Median sales price of properties sold in the Queenstown Lakes and Central Otago region at $402,000 was down 7% as compared to a year ago, and down significantly on the prior month. The asking price expectation of new listings remained unchanged as compared to a year ago at $525,073. The level of new listings coming onto the market in May at 259 rose fell significantly as compared to prior month and was up slightly by 2% as compared to a year ago. 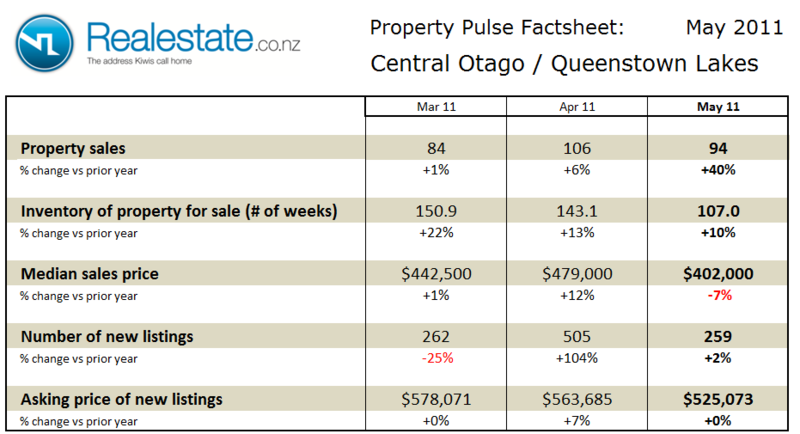 The Queenstown Lakes district region property pulse factsheet for April 2011 is published using data from Realestate.co.nz and REINZ (Real Estate Institute of NZ). 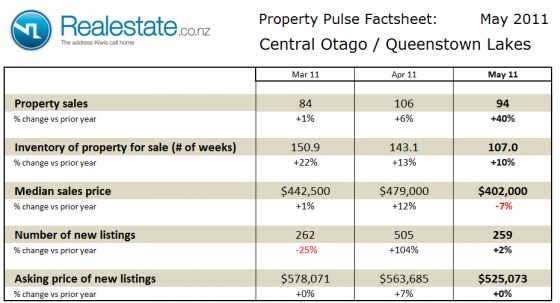 Property sales across the Queenstown Lake and Central Otago region at 106 in the month rose significantly on a seasonally adjusted basis in April and were up 6% as compared to a year ago. The inventory of unsold houses on the market at 143 weeks fell to remain well above the long-term average of 100 weeks of equivalent sales. Median sales price of properties sold in the Queenstown Lakes and Central Otago region at $479,000 was up 12% as compared to a year ago, and up on the prior month. The asking price expectation of new listings rose by 7% as compared to a year ago at $563,685. The level of new listings coming onto the market in April at 505 rose significantly as compared to prior month and was up 104% as compared to a year ago. The Queenstown Lakes district region property pulse factsheet for March 2011 is published using data from Realestate.co.nz and REINZ (Real Estate Institute of NZ). Property sales at 84 in the month fell on a seasonally adjusted basis in March and were up just 1% as compared to a year ago. The inventory of unsold houses rose to remain well above the long-term average at 151 weeks of equivalent sales. Median sales price at $442,500 was up 1% as compared to a year ago, and up slightly on the prior month. The asking price expectation of new listings was unchanged as compared to a year ago at $578,071. The level of new listings coming onto the market in March at 262 rose as compared to February but was down a significant 25% as compared to a year ago. 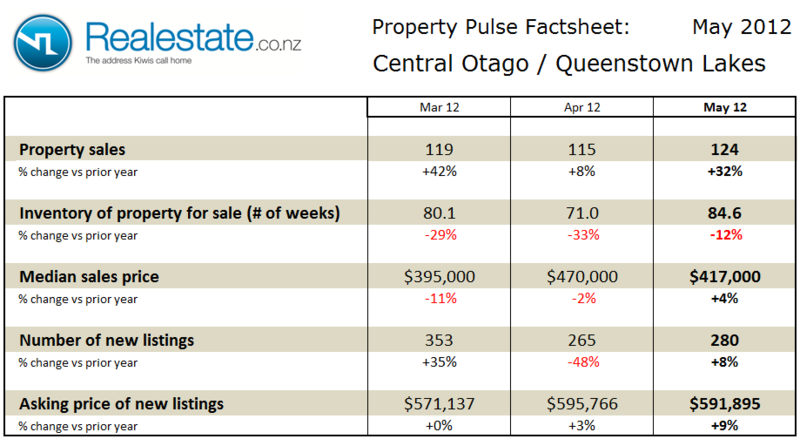 The Queenstown Lakes district Property Market factsheet for October 2010 can be downloaded by clicking this icon. Property prices in the Central Otago Lakes district rose further in September to $465,000. As compared to a year ago prices in the region are up by 14.8%. Property sales in the region slipped on a seasonally adjusted basis by 14.3%. There were just 77 properties sold in September exactly the same number as sold in August. Over the first 9 months of 2010 a total of 698 properties have been sold, this compares to 788 in the same period in 2009. Inventory of houses on the market fell to 105 weeks of equivalent sales. This September level of inventory is still above the long term average of 91 weeks. This would indicate that the market is slightly tipped in favour of buyers. The Queenstown Lakes district region Property Market factsheet for August 2010 can be downloaded by clicking this icon. Property prices in the Central Otago Lakes district slipped further in July to a 3 year low of $390,800. As compared to a year ago prices in the region are down by 4.9%. Property sales in the region also slipped significantly on a seasonally adjusted basis by 46%. There were just 48 properties sold in July down from up from 85 in June. On a moving annual basis property sales are up 5.6% with 1,014 sold in the past 12 months as compared to 960 in the prior 12 months. Inventory of houses on the market fell to 95 weeks of equivalent sales, this despite the fall in sales volumes. This July level of inventory is very close to the long term average of 91 weeks. This would indicate that the market is fairly well balanced between buyers and sellers.